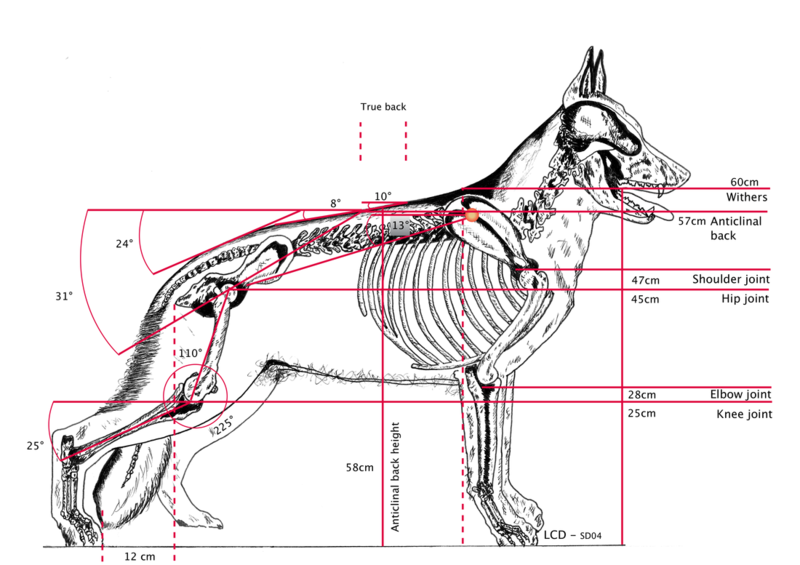 ​The following article demonstrates in some visual and measurable terms my observations and assessment of the primary skeletal changes that have taken place in the the German Shepherd Dog since the early 1900’s. People often ask me why I write my articles? I don't do it for those who consider themselves to be experts of which there is no shortage, nor do I write for those who are fortunate enough to be able to live in or regularly visit Germany. I write for people who are new to the breed and want/deserve factual information. I write for people who are not so fortunate as to be able to visit Germany once never mind regularly and I write for people who are subjected to photographs, many of which are photoshopped and have critiques that are often misleading, that is, putting aside size, the critiques too often in their stereotypical blandness can be interpreted as reflecting the photoshopped image. 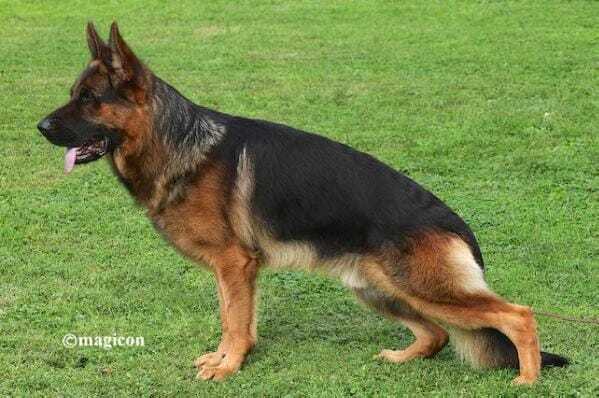 ​I write because I wish people to understand the German Shepherd Dog to the degree they know what constitutes a good dog and to contribute something meaningful to the breed and its future wellbeing. 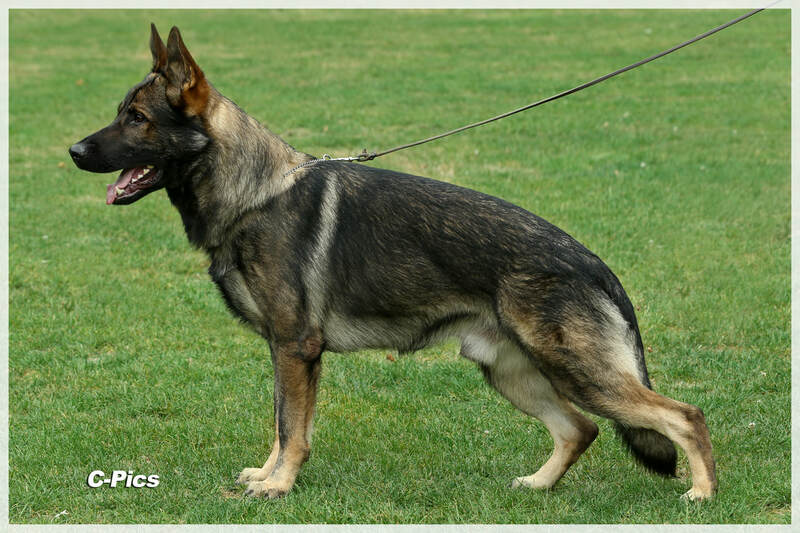 The German Shepherd Dog breed has developed in such a way as to have a definable population of ‘Show Dogs’, ‘Working Dogs’ and by far the largest and most diverse population of them all, ''Family Pets''. 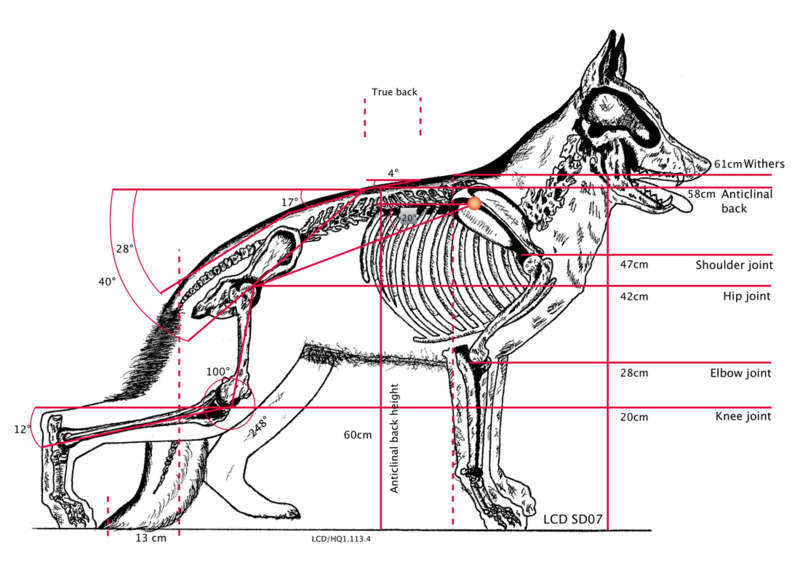 ​Other than attaining more length of the tibia and in some parts of the world a better length and angle of the shoulder blade and powerful heads ''Working Dogs'' on the whole remain in much the same skeletal frame as German Shepherd Dogs that existed in the early 60's. Whilst ‘German Shepherd Show Dogs’ have developed to the point of ‘’exceeding optimum construction’’, ‘German Shepherd Working Dogs’ have lagged behind, they have under shot their optimum construction. For the majority of enthusiasts in either camp, they don’t see it that way. 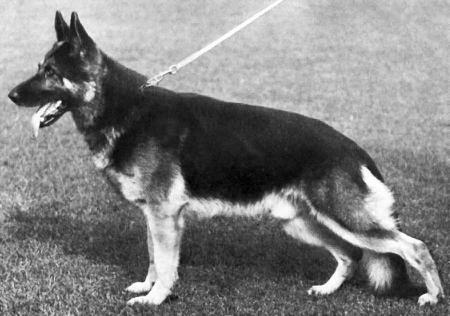 Show dog enthusiasts tend to see optimally efficient anatomical construction and balance of all parts as being a German Shepherd Dog that looks ‘’ordinary’’ and working dog enthusiasts tend to see optimally efficient anatomical construction and balance of all parts as ‘’overdone’’, and that is to the breed’s great loss. In my opinion optimum construction now lies somewhere in the middle of the show dog working dog divide. 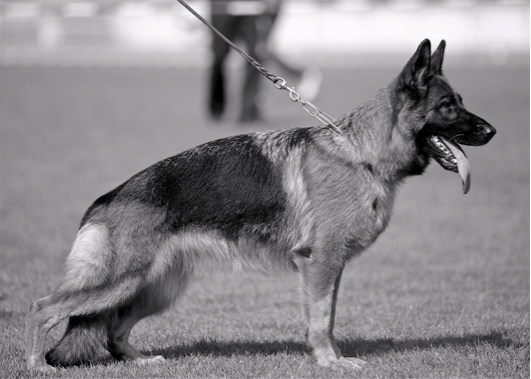 Show dogs and most of their owners need to take a step back in time, and working dogs and most of their owners need to take a step forward in time. In breeding dogs sometimes you need to take one step backwards to advance two, three or even more steps forward. 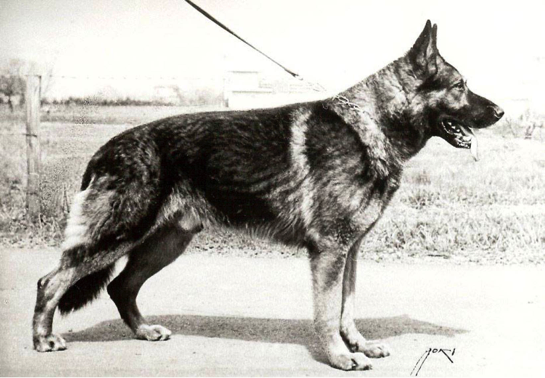 In seeking solutions to the breed's problems in a global sense it should not be an approach or mindset based on a ‘’them or us’’ mentality, it should be about the German Shepherd Dog. It should be about the German Shepherd Dogs health and its well being. It should also be about being respectful of a person's pursuit of whatever activity it is that they enjoy when owning a pedigree German Shepherd Dog and their right to freedom of expression and opinion. 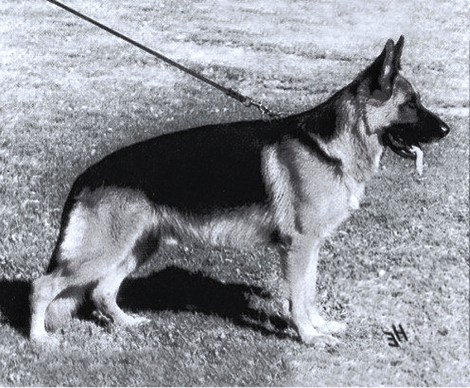 It requires either side of the ''Show Dog Working Dog Divide'' to commit to working slowly and methodically toward a mutually agreed long-term goal and to do so within their own environment, ideals and genetic constraints and at some point in time the differences between show dogs and working dogs would close to the point of becoming a blur. 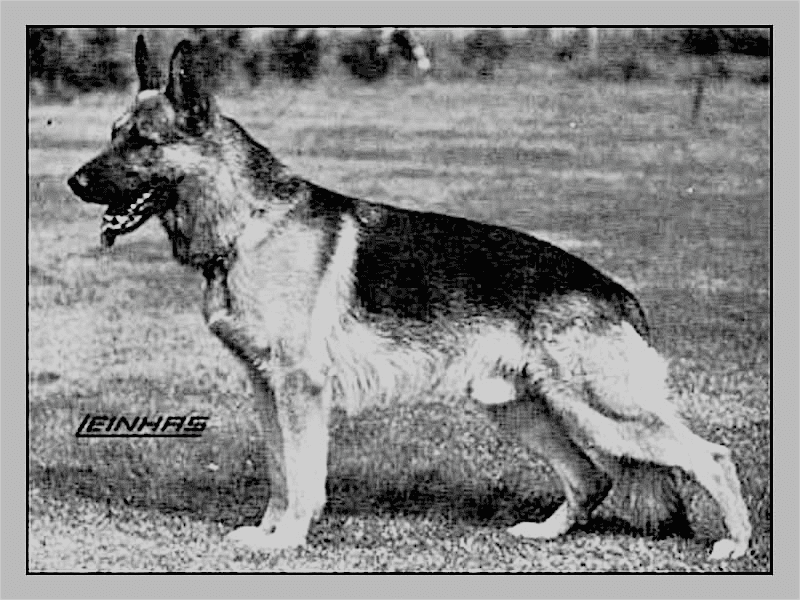 It is about commitment to the German Shepherd Dog's inherent reasons for being, it’s about idealism, putting the breed ahead of self-interest and above all else, it is about effective, inspiring leadership within the SV and WUSV. 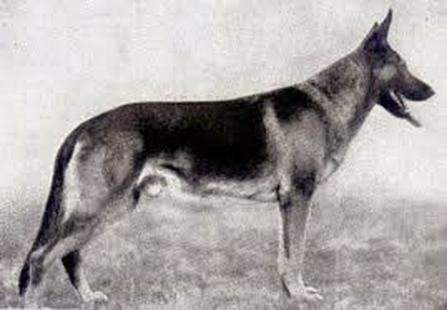 Other than the ‘’very rare’’ case of a mutation, no structural trait that exists in the breed today such as large size, overangulation, short steep upper arms, pale colour, steep short croups, big soft and or low set ears and even the now endemic curvature to the spine did not exist in the breed in 1899 when the ‘’German Shepherd Dog’’ was first registered as a breed of dog. Structural changes and increased genetic frequency of those changes have progressively occurred as a result of a very small number of very influential individuals within the SV. 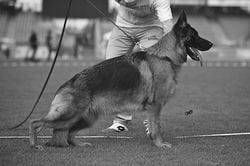 Those individuals identified traits which they considered to be desirable, and whether they were or not, male dogs that possessed those traits were promoted for stud use via the show ring and more particularly the German Sieger Show via the Vorzuglich Auslese [VA - excellent select] award. Because of the enormous influence of those individuals, other Specialist breed judges perpetuated those decisions not just in Germany, but in many other countries. 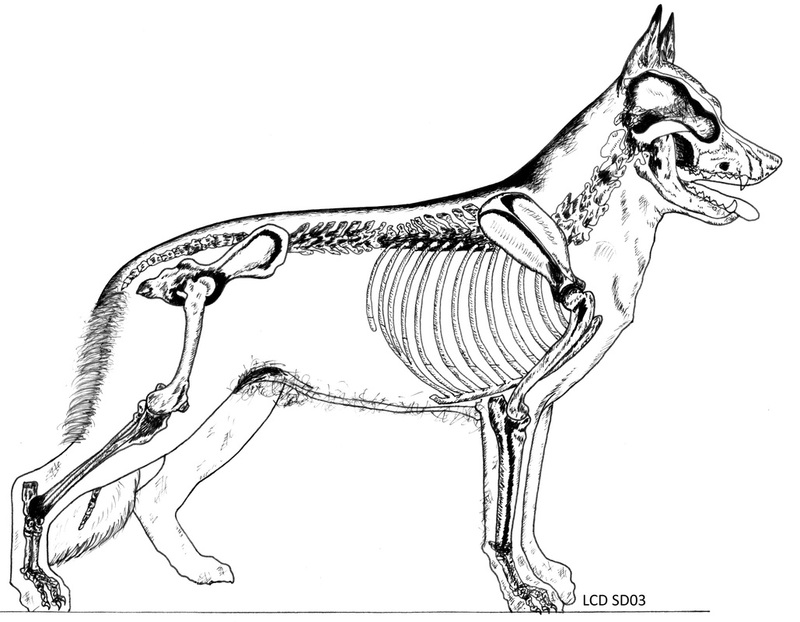 Dogs that possessed [predominantly in phenotype] the gene/s for a particular trait such as a stronger back [in this context a higher position of the anticlinal region of the spine relative to the top of the shoulder blade], had significant stud use. Those with a weaker back regardless of any other positive features they possessed had significantly less to zero stud dog use. 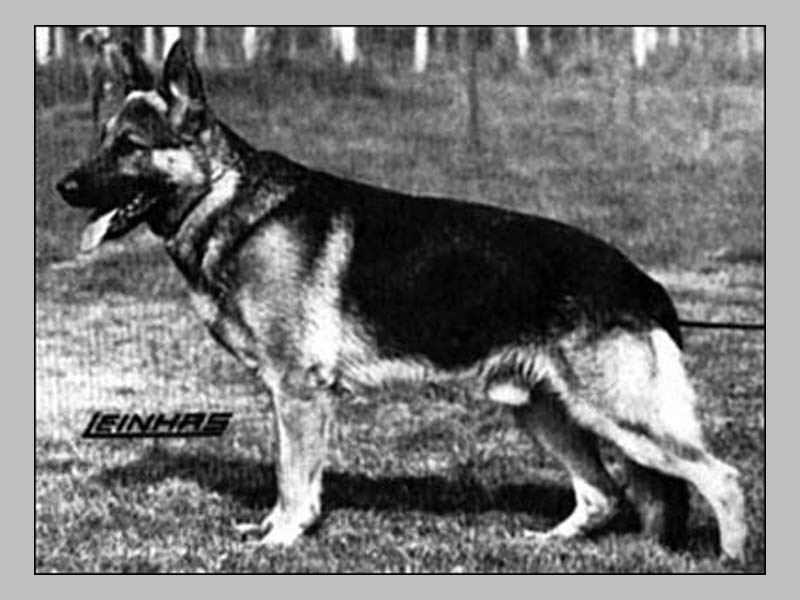 This created a major shift in that particular gene/s percentage [gene frequency] within the ''German Shepherd Show Dog population'' and as an aside it saw the demise of many previously influential GSD Kennels in Germany. This shift was created by years of line breeding and inbreeding on a relatively small number of male dogs, by taking the breed from being influenced directly and indirectly by 12 or so dogs in the 40's and 50's to 5 or 6 now. The start of serious narrowing the blood base began in the 80’s. VA3 - Quanto v d Wienerau at 3rd generation on the sire’s side. VA7 - Quanto v d Wienerau 4th generation. VA10 - Canto v d Wienerau in the 3rd generation. VA11 - Canto v d Wienerau line bred 3-4. Enthusiasts may point out that during this period two other dogs were overlaid across Canto and Quanto. Marko vom Cellerland and Mutz von der Pelztierfarm. In the context of meaningful ongoing impact Marko and Mutz were to have little real relevance, particularly Marko. In truth this 1983 Sieger show and its immiediate post show period represented their rapid genetic dilution. The interesting aspect of this dilution is that these two dogs represented working dog lines, the very needed fork in the road. The 'show dog working divide' at this period in the breeds development was well established, but it was about to be reinforced and in my opinion, irreversibly! Narrowing of the blood base and the perpetuation of that narrow bloodbase approach reduced genetic variation and eventually ''manageable corrective breeding scope'' itself. This is now a very significant problem for the breed in trying to go forward in some key areas such as correcting the downward bend/curvature to the lumbar spine and overangulation of the hindquarters! Simplistically speaking, everybody is now someone’s aunt or uncle with - no surprise - too many dogs sharing the same problematic traits. Problematic traits that should be identified as faults and reduced in frequency, or better still eliminated, have become so endemic in genetic terms they have become ‘normalised’, meaning they have become accepted, for some enthusiasts even desired, and for reasons of economic self interest once a trait becomes normalized it can lead to irreversible type change. The drawings and photographs contained within the body of this article depict the primary developmental stages the breed has progressed through since the 1900’s. The ‘working dogs’ progression is not shown because other than the few changes stated earlier there hasn’t been any progression! 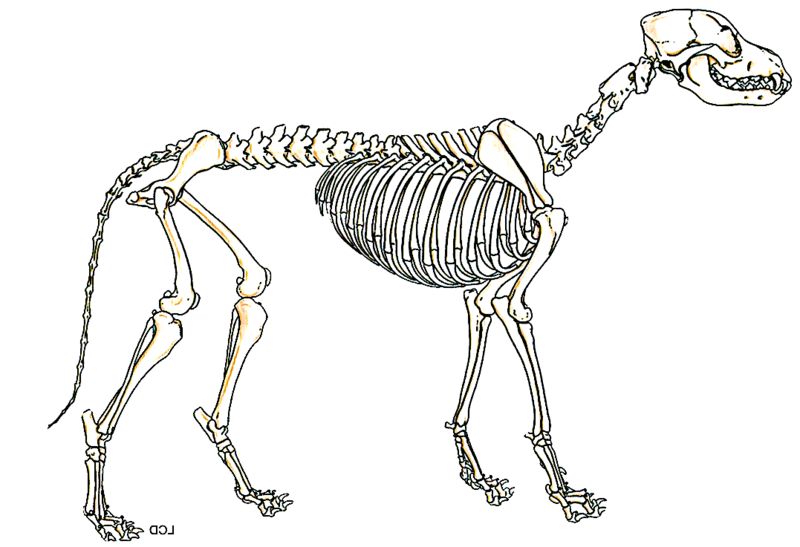 Obviously not all dogs are constructed the same, what is shown here is ‘’broadly indicative’’; it represents the core driver of evolutionary development. The SV standard defines the ‘back’ as being the region of withers to croup. 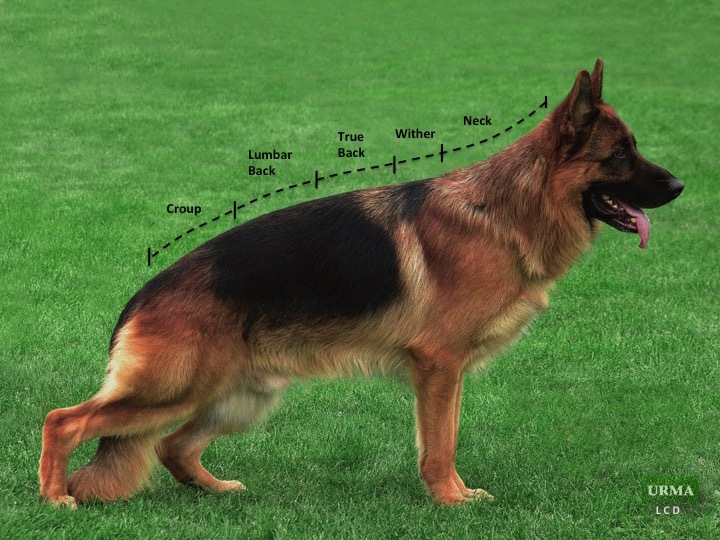 My definition of the back as demonstrated here on a contemporary show dog, is divided into ''true back'' and ''lumbar back''. The reason for this divide, to see the back in two distinct sections thoracic and lumbar will become clear as your read through the article. The earliest dogs, circa 1920 - 1930 were of an elongated rectangular form. They had a light body frame, had a tendency to being overbuilt i.e. their lumbar back was not level, it sloped very slightly rear to the fore. They had a weak back in the context of the back being withers to croup and they had a tendency toward a forward placed shoulder assembly associated with a steep shoulder blade and very short steep upperarm. They had a shallow rib cage, proportionately too long loin and viewed from the side their ribs were rotated a little too forward. Their hindquarters were under-angulated and therefore they had a too high hip and knee position. Their tails generally reached to the hock or at most the middle of the rear pastern. The position and steep angle of the shoulder blade in technical terms gave them a high withers height. 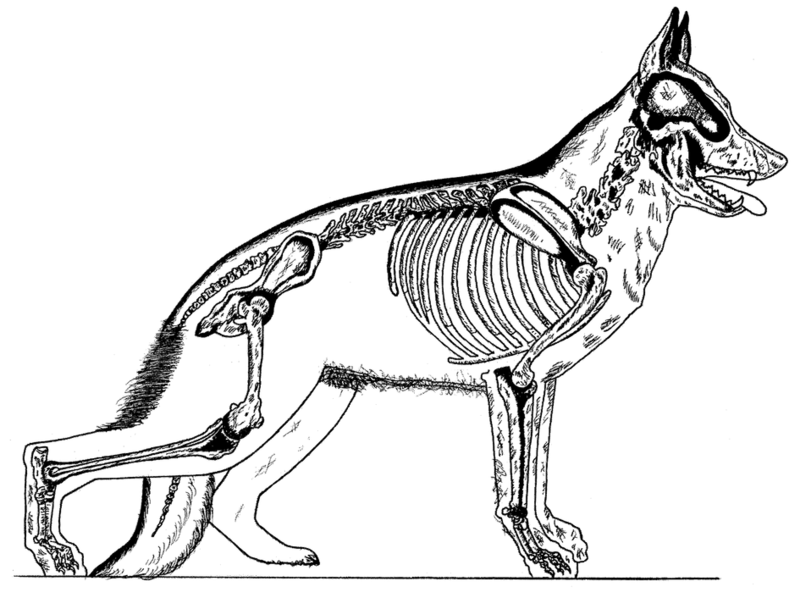 These primary elements gave the general visual impression of a tall, relatively fine boned dog that was under angulated, long bodied, lacking in fore chest and with very long fore and hind legs. The trunk shape was in the form of a level rectangle. Because the impediments of the forehand equated to the impediments of the rear hand, it gave reasonable locomotive balance. The stride excursion distance of dogs in this period was quite restricted especially by today's standards, but when added to a light frame and generally very good fitness they had very good powers of endurance. In significant genetic frequency terms the forward position of the shoulder assembly was improved circa 1950 but the upperarm did not show improvement until circa 1970, some 60 years after the breed's creation! Improvement in hind angulation occurred as the pelvis angle improved, which was at about the same time as chest to foreleg ratios improved circa 1970 and this brought tails to the ground. 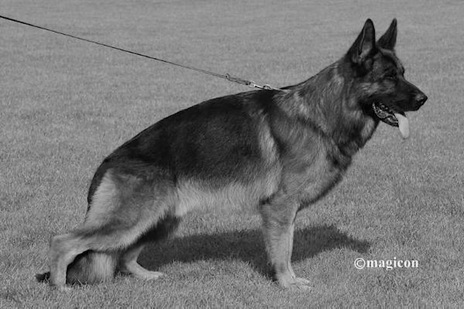 A significant improvement in the upperarm did not come about until the mid 80’s but still remains an elusive trait for the majority of dogs and that applies more to ‘working dogs’ than ‘show dogs. Back strength improved around the late 1960’s but overshot the mark. The introduction of a curvature to the back via a downward bend to the lumbar spine came around the late 80's. Oversize, overangulation of the hindquarter and tails that were far too long appeared circa 1990. ​A short flat angled pelvis creates narrow breadth of thigh. A narrow thigh means the lateral muscle mass in the hindquarters is narrow and consequently the drive/rear thrust is less than optimum. Because dogs of the 30’s and 40’s era had a restriction of the forehand this was not as important as a later period when the forehand improved. A case of skeletal limitations but skeletal balance. As the anticlinal region of the back got higher in relation to the top of the shoulder blades it made the back 'arguably' stronger, but when it got too high it diminished the withers definition, its slope and to a degree, its efficiency. Along with other changes relating to the forehand and hindquarter this changed the rectangular form to one of an egg. 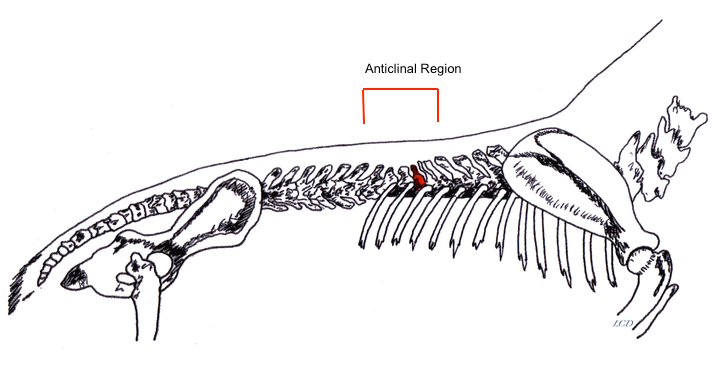 In increased breed frequency terms the rise in the anticlinal region of the spine has been in progressive stages and an ongoing work in progress. The first anticlinal rise came in the late 1950’s followed by a further heightening of the rise around the early 1960’s, circa 1970, circa 1980 and circa mid 1990 where it plateaued because many dogs were now level in the withers. Any further rise increased the number of dogs where the anticlinal region of the back was higher than the withers and consequently these dogs fell on the forehand when trotting, especially at high speed. ​As the anticlinal region rose it emphasized the lumber spine slope. The distinct skeletal downward bend and curvature to the spine first appeared around 1990 and just like excessively long tails, by 2000 it had become so endemic it had become the norm and it remains so to this day! The standard [ FC1/SV No 166 - 23/12/2010/EN] states the back should be straight, and even though ''straight means straight'' and ''curved means curved'', dogs exhibiting a curvature to the back as a result of a downward bend to the lumbar spine remain described by most judges of the German Shepherd Show Dog as having ‘’a straight back’’. As such, dogs with a curved back are considered by most enthusiasts to have a straight back and therefore in regard to the standard they have a correct back! ​I say general curvature because some dogs have a downward bend to the lumbar spine, but the lumbar spine itself is straight. Ironically, when the lumbar spine is straight as opposed to curved this creates a defined peak in the topline at the first lumbar vertebra, at the thoracic and lumbar spine transition point. Ironic because a curved spine creates a smoother lumbar thoracic transition and a more pleasing impression! Who would have ever believed a dog with a curvature of the spine would be admired, even sought after? This ‘demarcation’ in the backline creates a distinctive visual fall away and quite often a slightly less smooth tail set. These two lumbar spine variations ​are seen below. ​In a general sense deeper angulation of the hindquarter first appeared in the late 80's early 90's as a consequence of the anticlinal rise creating a moderate downward bend to the lumbar spine, not as a consequence of an increase in the length of the tibia. The shift from deep hind angulation to overangulation came around 2000 as a result of a too long a tibia. As the hip gets lower the tail gets closer to the ground but this is also around the period when tails got longer, became far too long. Stand up straight, keeping your back straight, lower your hip toward the ground by bending your knees a little. Just to a point where you have a ‘slight bend’ in your knees. This exercise is akin to Dog 1 [seen a little further on] in that your hip is still in a high position relative to the ground and your femur and tibia are just slightly angled. Now let your hip drop much lower and as you do this the angle of your femur and tibia will increase to the degree seen in Dog 2. 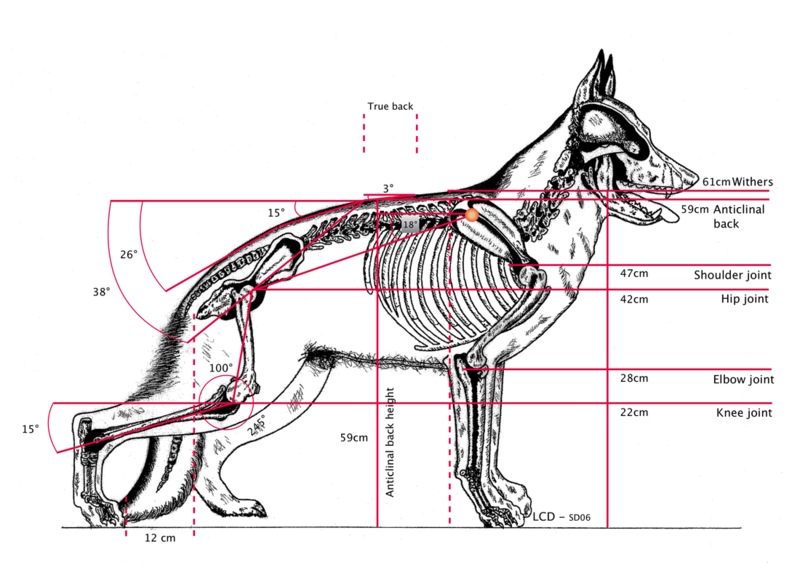 It may not seem so, but Dog 2 has the same length of femur and tibia as Dog 1. Whilst your back remained vertical and straight, what you experienced is equivalent to the impact of the lumbar spine bending downward in the dog. 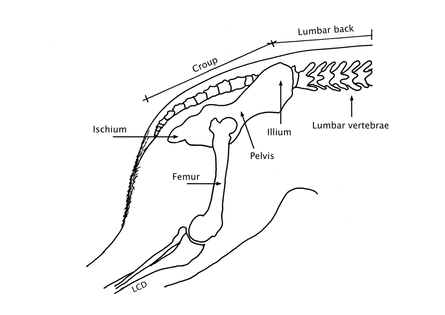 As the lumbar spine bends downward, the pelvis follows it. The downward bend lowers the hip toward the ground and as this happens it increases the angle of both the tibia and to a ‘’much lesser degree’’ the femur. With the downward bend of the lumbar spine the tibia angle changes significantly but the femur angle only changes a few degrees. 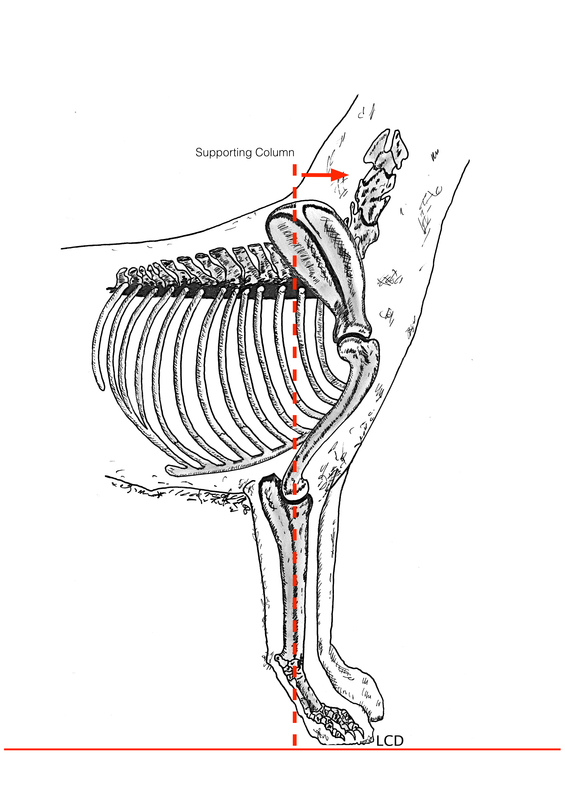 This small angular change to the femur happens as the femur is pushed downward. As it is pushed down it is pushed slightly forward at the knee and this creates the increased angle. 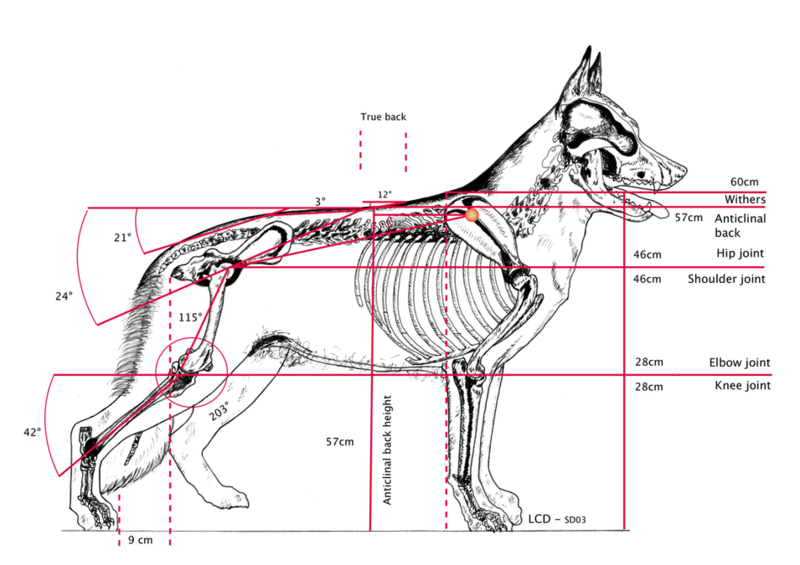 To summarise the above in a visual way, the following two dogs have approximately the same length of femur and tibia but very different angles of the lumbar spine, pelvis angle and hip to ground height. 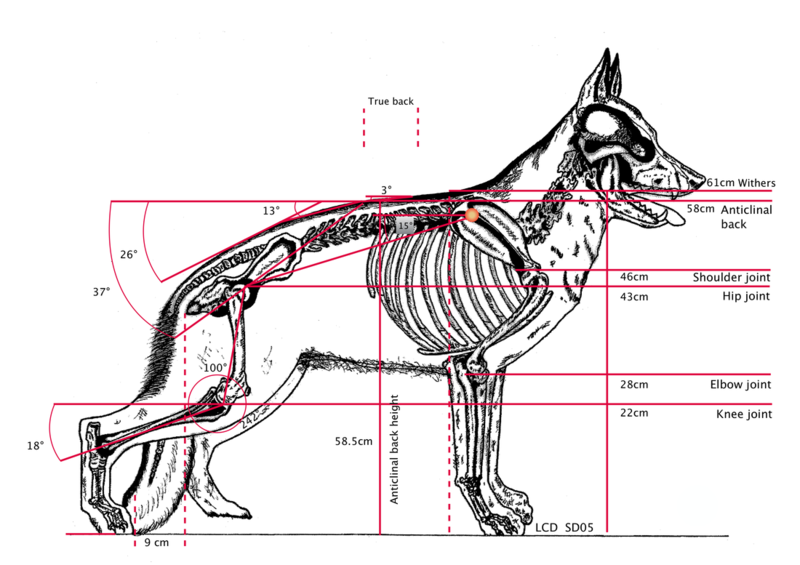 Notwithstanding there may be a withers height difference between the two animals this demonstrates why when comparing various dogs hindquarter angulation they can look very different even though their femurs and tibias are the same length. 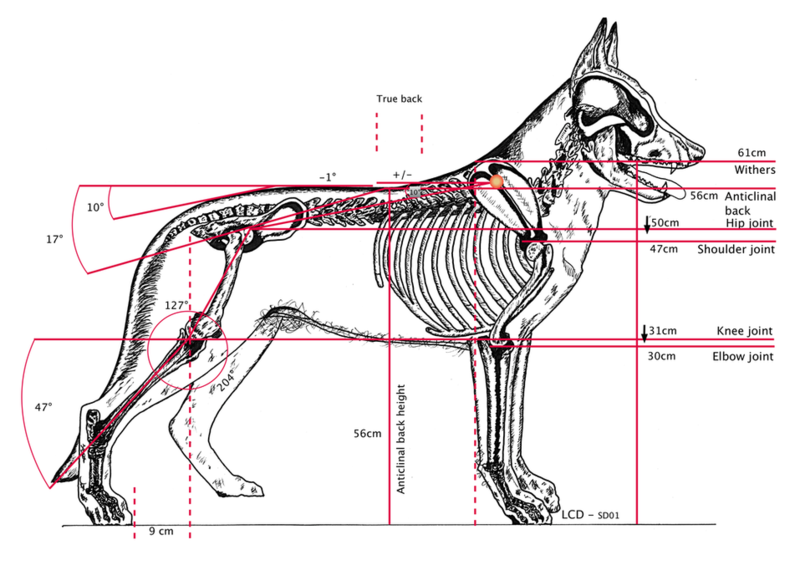 This is significant in understanding overangulation, in understanding the changes that took place in regard to the German Shepherd Show Dog hindquarter angulation, in understanding the relevance of hip and knee height to the ground and understanding the extended tail length. 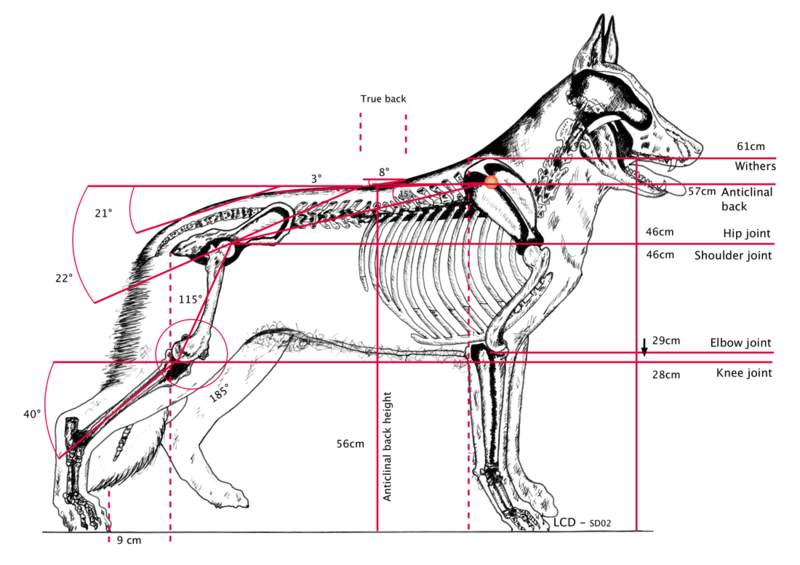 How does the lower hip and knee position created by the rise in the anticlinal back and downward lumbar spine bend impact on the dogs movement? It is contrary to what many people say and it is contrary to what many 'experts' believe! 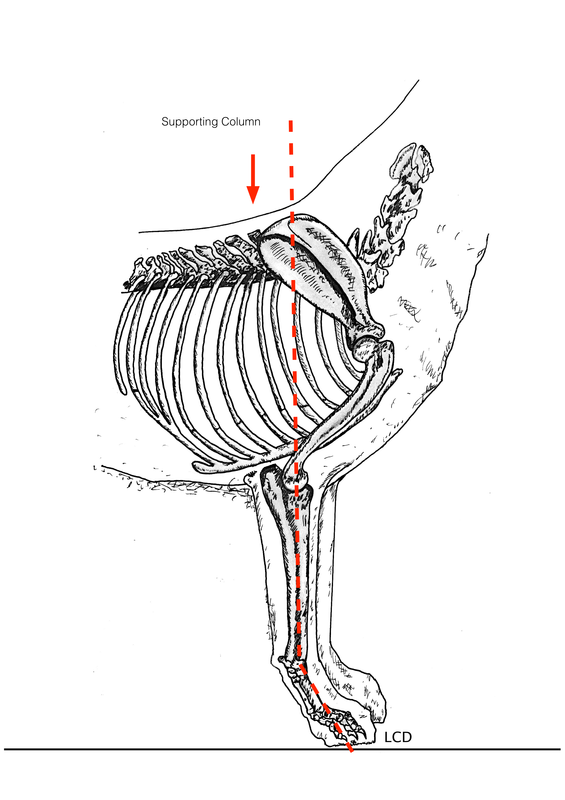 After the downward bend of the lumbar spine came the overlong tibia with the associated instability of the hindquarters and unstable close stepping hock joints and in many cases of extreme overangulation the rear pastern not opening out fully and the feet travelling too close to the ground creating a shuffling action. 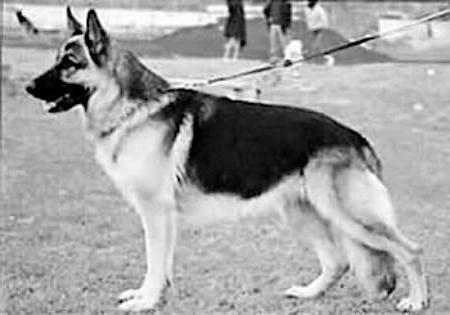 There was a period in the German Shepherd dog's evolution, the 80's, where hindquarter angulation was ‘’right on the mark’’. It satisfied the fundamental needs of a trotting dog, but ‘’more is better’’ took control and it is not letting go anytime soon! 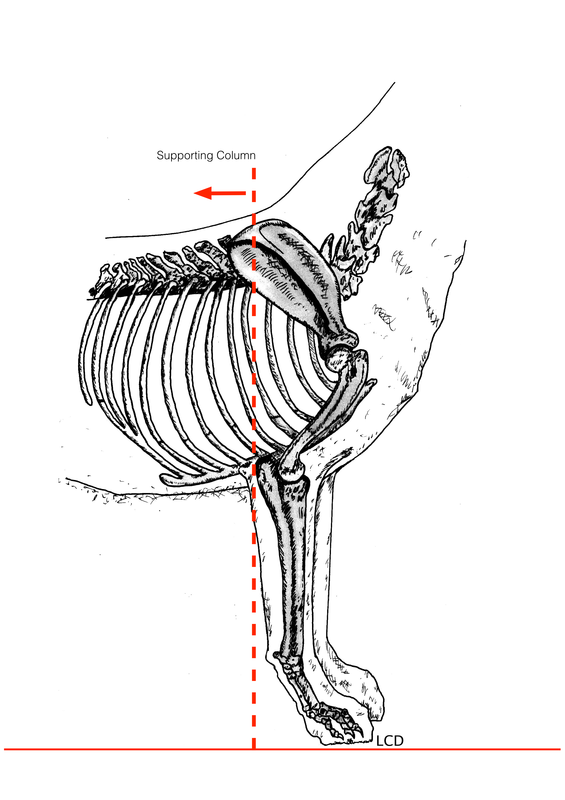 Many dogs today have footfall timing problems because of an imbalance between the fore-hand and rear-hand angulation. 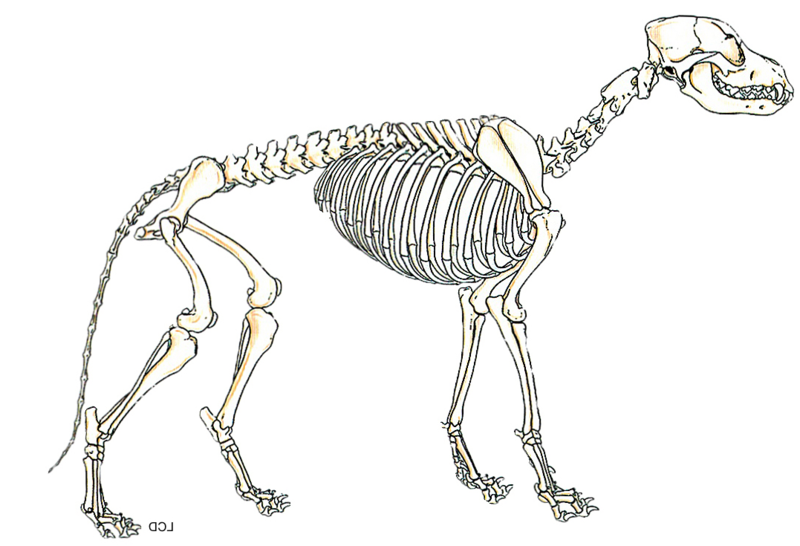 Dog 1 - Has a straight lumbar spine, slightly sloping topline and well angulated, well balanced fore and hind angulation. Dog 2 - Has a downward bending curved lumbar spine, an excessivly long tibia and even with his excessive forehand angulation he has unbalanced fore and hindquarter angulation. Yes dogs can be overangulated in the forehand. The topline slope is excessive and the tail is excessively long. 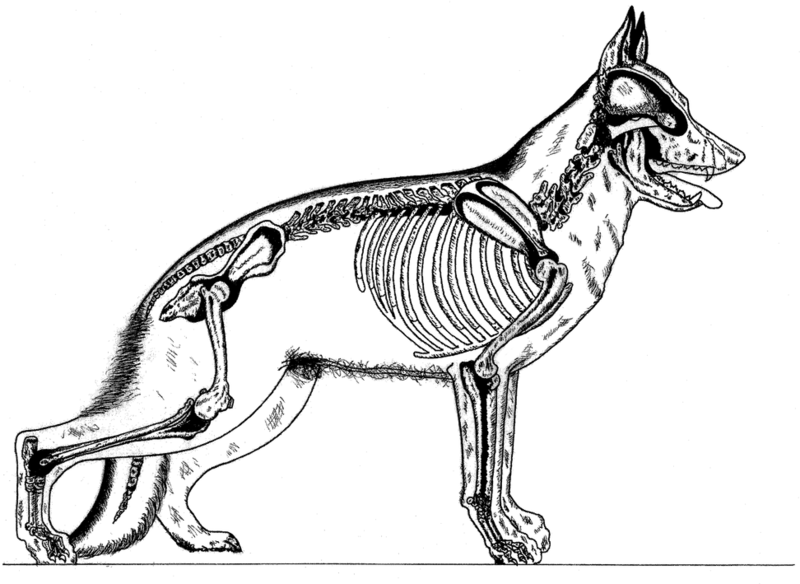 Generally speaking, dogs of this era were overbuilt in the hindquarters and as a consequence they had too high a hip and knee position, a very weak back, short under chest, forward placed shoulder assembly and a steep shoulder blade that created very high withers relative to the true back - a steep shoulder increase a dogs height at the withers. They had a short neck because of the shoulder blade positioning and for that same reason they had higher withers height as measured from the ground. They had a short steep upperarm, when associated with a high hip position this created a shoulder joint that was too low relative to the hip joint. 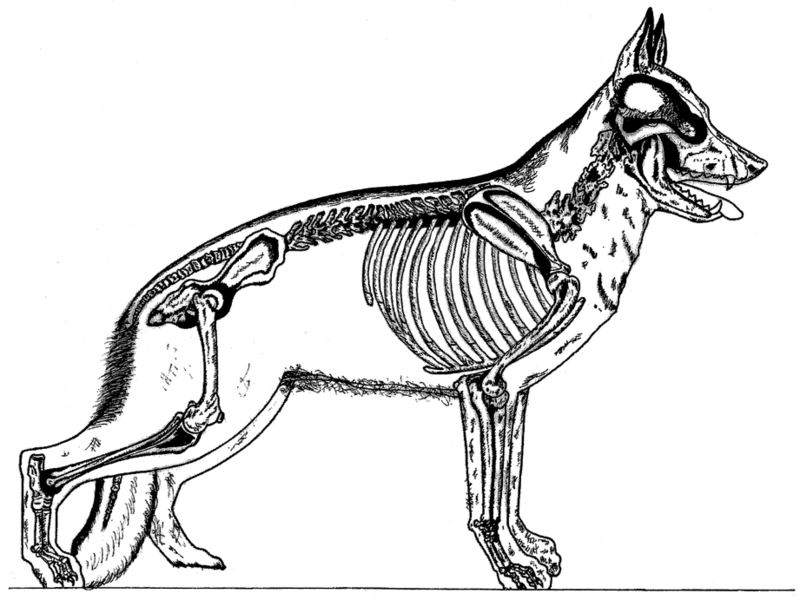 Dogs of this era tended to have a short flat croup and under angulated hindquarters. The tibia and femur were of a very good length but because of the flat pelvis angle, they are were too steep. The pivot point angle of 10° is very effective in regard to the transmission line. Tail length complied with the standard i.e., ‘’the tail extended to at least the hock joint but not beyond the middle of the rear pastern’’. ​Circa 1940 we had dogs with a better pelvis angle and a lumbar back that were showing a very slight front to rear slope. It gave better croup moulding and brought the relationship of the hip and shoulder joint into a much better horizontal alignment. The backs are a little stronger during this period as the anticlinal region rises, but it is still short of optimum strength. The shoulder assembly on many dogs remained a little too forward placed, but there were signs of improvement and these dogs were promoted via the VA process. The shoulder blades are still steep creating a too high withers position, the short steep upperarm remains entrenched. With the slightly lower hip position created by a better-angled pelvis the thighs are getting a bit broader and the horizontal alignment of the hip and shoulder joint is much better. The hindquarter angulation at 185 degrees shows an improvement, and this is reflected in the femur and tibia angle. Tail length continues to comply with the standard. In the 70's the lumbar back retained the very slight slope of about 3 degrees. As the anticlinal region of the back increased in its height relative to the withers it also increased its height from the ground and this increased the trunk depth in the forward loin region a little. This rise in the anticlinal region of the back meant backs got a little stronger, but most were still weak. Under chests improved, as did bone strength. The shoulder assembly and positioning improved, and this reduced the dogs measurable withers height, my guesstimate based on scale is that it would be in the region of 1cm. Short steep upper arms remained entrenched but there were signs of improvement and with the slightly lower hip position created by a better-angled pelvis the horizontal alignment of the hip and shoulder joint was much better. Stride distances got better. The further angling of the pelvis contributed to the ongoing improvement of hindquarter angulation and this was reflected in the relationship between the femur and tibia angle and knee and elbow joints. The longer pelvis is became more frequent and is seen in an increasing number of dogs showing a broader thigh and better rear thrust. Tail length continued to comply with the standard. In the 1980's the anticlinal region of the back rose further and as a consequence, the backs are now ''very strong''. The further rise created more slope to the withers and the lumbar spine, this created more slope to the back and for the first time we saw backs in a relatively straight line withers to croup. This further rise rotated the ribs slightly rearward. Dogs are now showing the early signs of greater strength and substance. 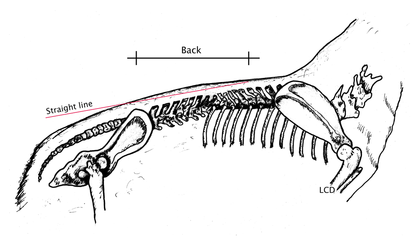 The withers are now consolidating as high, long and efficient but visually they are less defined as a consequence of the further increased anticlinal rise.The shoulder position, length and angles of the shoulder blade and forechest development was significantly improved as were stride excursion distances. The length and angle of the pelvis seen in a growing number of dogs was at its optimum, no further increase in pelvis angle was desirable. The upperarm continued its improvement all be it slowly; some dogs were now being seen with a steep but long upperarm. With the further incline to the back, pelvis and lower hip position hindquarter angulation was markedly improved. Anatomically speaking the optimum on a number of fronts was attained during this period. ​In the 90’s we saw ‘’significant changes’’ taking place. 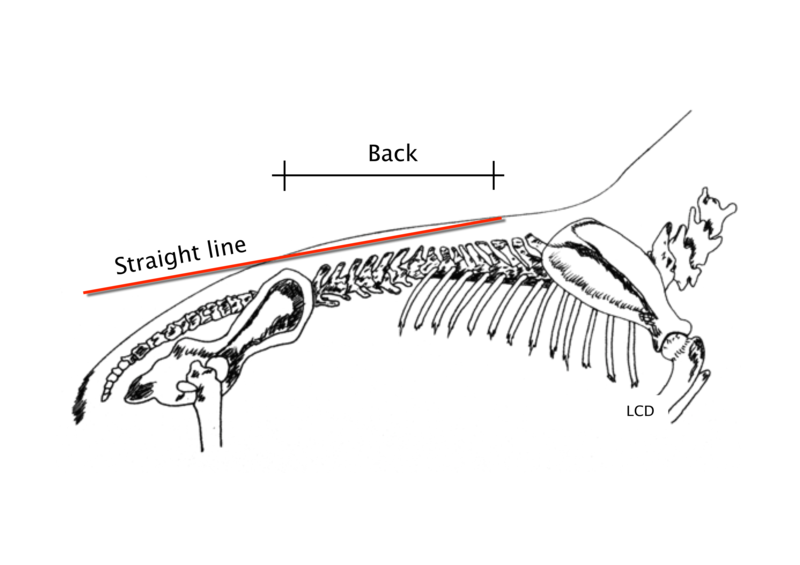 Forequarter angulations and their bone lengths improved significantly, and this was reflected in an increase in chest depth. The anticlinal region of the spine became even higher and this caused the tops of the dorsal thoracic processes to rise above the top of the scapulae and this further diminished the withers definition, its slope and its efficiency. 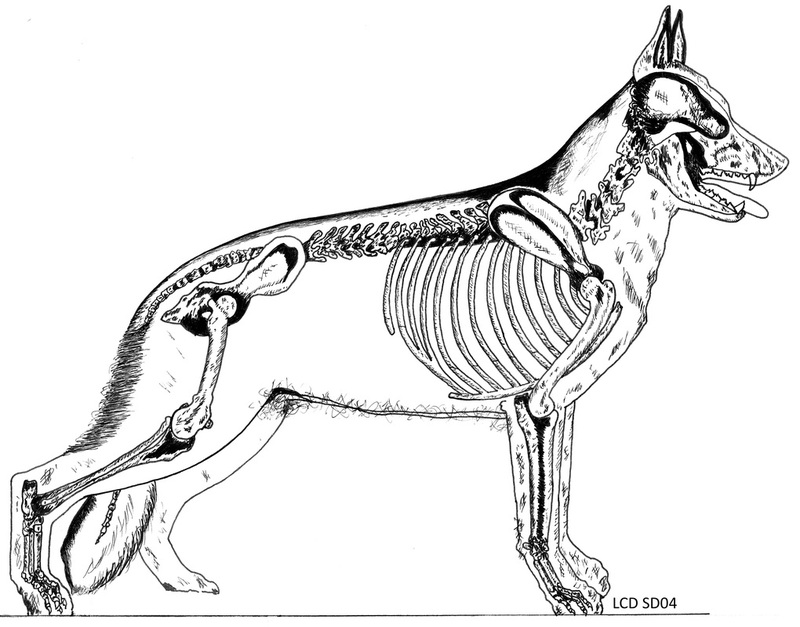 This period also saw an influx of dogs with a downward bend to the lumbar spine, some of which show a peak in their back when the lumbar spine is downward bending and straight as opposed to downward bending and curved! This is because a curved spine gives a smoother transition into the thoracic spine. 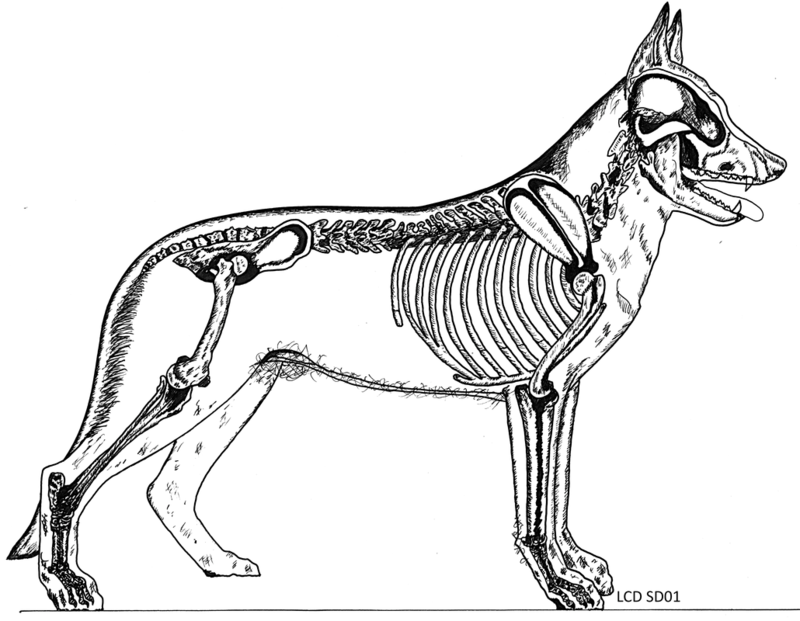 More dogs were seen with a very good length of the pelvis and a subsequent broader thigh. 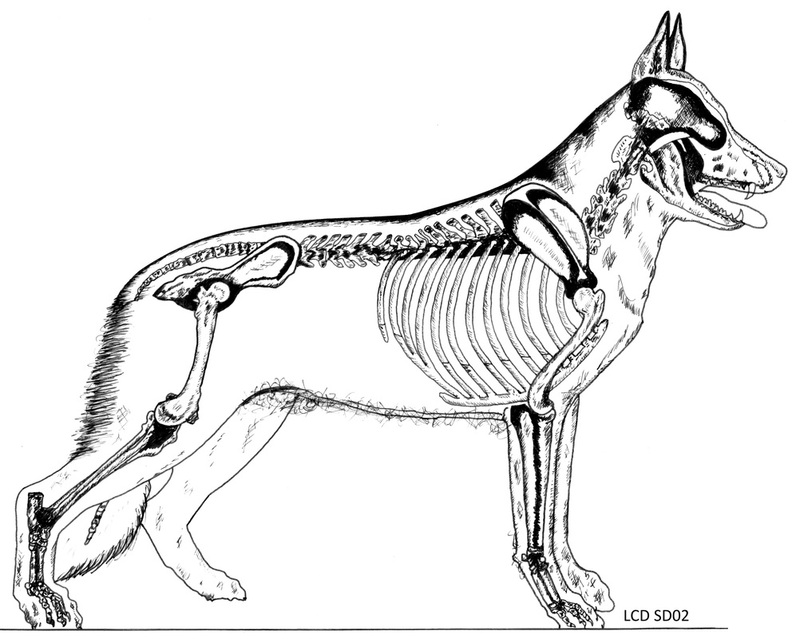 When the very high anticlinal rise is added to the downward lumbar bend, the pelvis on many dogs became steeper, and their hip lower to the ground. In an optimal sense the angle of the rear and fore pivot points at 15 degrees was now getting too steep. The energy transmission line from the rear to the forward pivot point is now curved; the knee joint is now too far below the elbow joint. The hindquarter angulation, in general population terms, is now a mix of optimum at about 9cm >10cm and excessive at 12cm but rapidly moving in favour of excessive in all its varying degrees and configurations i.e overangulation is not just created by an overlong tibia!. There is now an increase in the number of dogs that are slightly loose in the hock joints and have a tendency to a section of the rear pastern making contact with the ground on the fore step instead of only the sole of the foot pad. Tails are now literally longer and making full contact with the ground in stance. 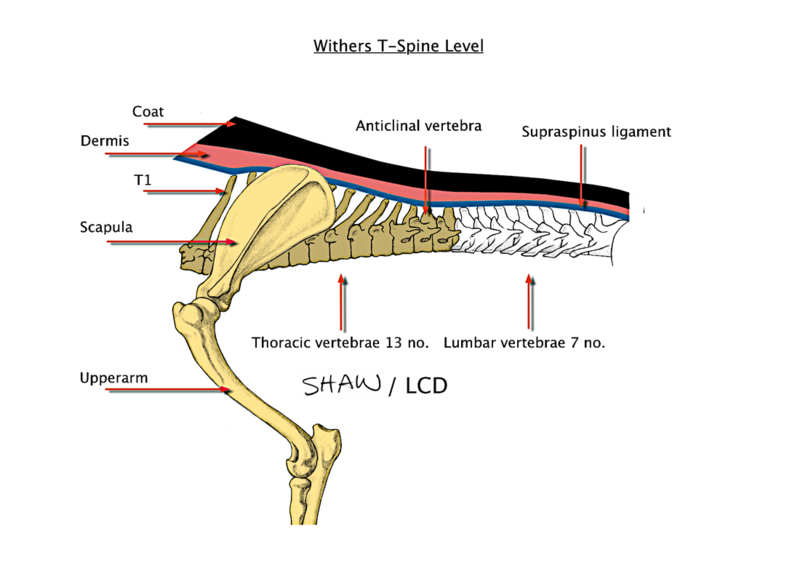 ​The early 2000’s herald’s a significant increase in the number of dogs with a very high anticlinal spine position that in some cases removed the withers definition to the point of the withers being level. The increase in dogs with a downward lumbar spine bend is such it sees the trait become normalised, and the angle of the rear and fore pivot points has increased too much to 18°. The vast majority of show dogs now have some degree of curvature of the spine and this further increases the curve and downward forehand direction of the energy transmission line. Forehand angulation continues to improve, in some dogs the forehand angulation is becoming overangulated. Heads are getting much stronger, in some cases usually associated with oversized dogs too strong and this is associated with an increase in dogs with loose upper and lower lips. As the forehand angles increase and the anticlinal back continues its rise even higher chests get deeper. I have not reflected it in my diagram but during this period dogs are becoming larger and therefore more substantial and this is at the expense of dogs of true medium size who are rapidly being considered to be too small! An increase in tibia length sees more dogs past the optimum. As a ''rule of thumb guide'', it can be observed during this period that as the tibia exceeds the length of the femur lateral instability of the tarsocrural joint ensues. This instability occurs as a result of lateral stress being applied to the tarsus ligaments, more particularly the anterior tibiofibular ligament. In the vast majority of dogs [not all] the greater that differential length the greater the tarsocrural joint instability. Viewed from behind this instability manifests itself in varying degrees of ''close standing and close stepping hocks'', ''unstable hocks'' and ''cow hocks''. The degree of instability increases with increased speed and increased rearward extension of the tarsocrural joint. If looked at closely more dogs can be seen to travel with their rear toes too close to the ground, lifting their forelegs at the elbow as a compensatory consequence of their overangulated hindquarters, travelling with their rear pastern partially flat to the ground and generally having unstable bouncing hindquarters. This period sees an increase in actual tail length [the downward lumbar bend just brought the tails closer to the ground] and consequently more dogs are seen with their tails running along the ground when they are standing and many can be seen bouncing off their hock joints when the run. ​In a trotting dog any excess to needs or any instability of functional parts is wasted energy and therefore an impediment to endurance. In aesthetic parlance, any excess to needs is a diminishment of the dog’s beauty because it is a diminishment of its inherent function. 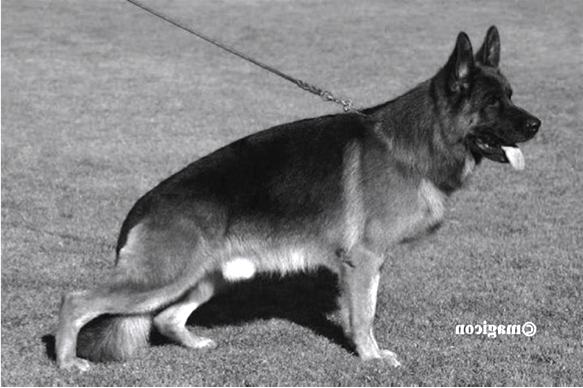 There are many traits of great virtue that will continue to be consolidated in the German Shepherd Show Dog however, if the current trend continues, we will see a further increase in gene frequency favouring large dogs dogs with a curvature of the lumbar spine and overangulation of the hindquarter with its consequent hindquarter instability and myriad of footfall timing problems. There is a very old English proverb, "Hwa is thet mei thet hors wettrein the him self nule drinken". ‘’You can lead a horse to water but you can’t make it drink’’!